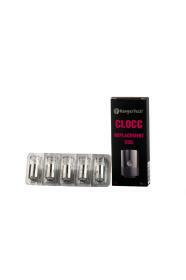 WARNING: This product (CLOCC 0.5Ω 316L SS316L) is intended for use only with the appropriate sub-ohm equipment. By purchasing this product you agree to operate it in accordance with the instructions provided and accept full responsibility for its safe use by yourself and others. For devices using 18650 batteries, minimum rating must be 20 amp continuous or better.